What do you know about walls? If not enough, then this quartet pack of cards designed by Marek Vogt from Rotterdam is for you. It has been released in 2009 for the 20th anniversary of the fall of the Berlin Wall. 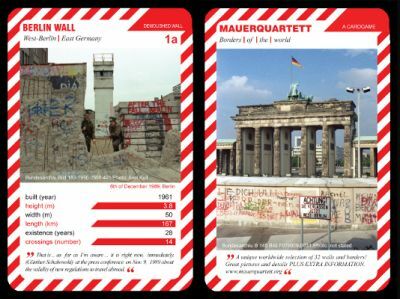 32 walls and borders have been selected and each card gives facts and anecdotes below a colour photography. 4 extra cards give an introduction, additional information and a world map. More illustrations can be found in the German and English web site www.mauerquartett.org. 2500 packs have been printed in Germany. Price and where to find: € 12,50, e-mail info@mauerquartett.org or check bookshops in Germany and in the Netherlands.